For lovers of underground house music in Perth, there’s always been one place you could go… Geisha. And this weekend marks an impressive milestone in Perth clubbing history, as the ‘Home of House’ celebrates its 20th birthday this Friday, January 25, with the legendary Way Out West playing live. ALFRED GORMAN speaks to Geisha’s Director Warwick Clancy about two decades of parties at this local institution. Every weekend for 20 years, the unassuming door off James St has led you upstairs to an intimate, hedonistic late-night playground for like-minded people to come together and celebrate their love of music. Music has always been first and foremost the focus of Geisha, and that has been a big part of its success. Dedicated to bringing you the finest house and techno DJs from around the world, as well as their vital support to developing local talent, with some of the best residents around and one of the best sounding dancefloors in town. To celebrate the big occasion in typical Geisha fashion, they’re flying in one of the most legendary duos in the history of house for an exclusive live set. 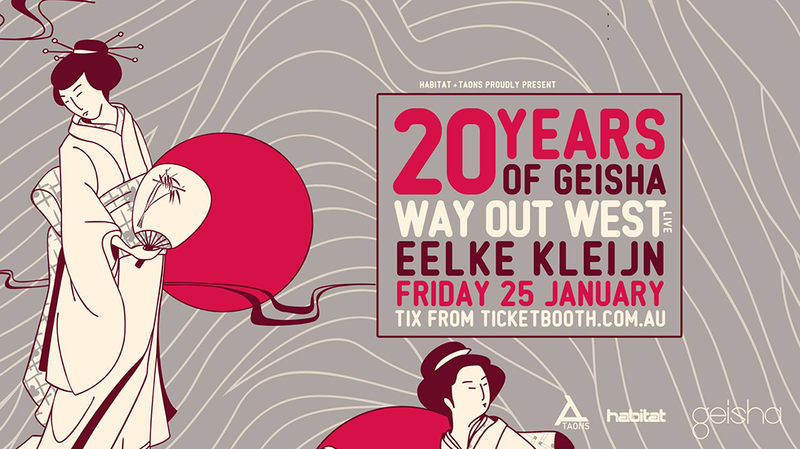 Way Out West (Nick Warren and Jody Wisternoff) will be gracing the booth on Australia Day Eve, Friday January 25, supported by acclaimed Dutch producer, composer and artist Eelke Kleijn. It promises to be a large night. Since the beginning, one man has been at the helm, quietly guiding the club’s direction from the shadows, working as Manager, and now Director – Warwick Clancy. Firstly, congratulations Warwick on 20 years of Geisha! How and when did you get involved with Geisha, and who else was involved in the early days? I became the Manager in mid 1999. Geisha had opened in January 1999 with then owner Mardi Wilson and her partner at the time, and head DJ, Saxon. Before Geisha I studied Hospitality and had been the Operations Manager of DC’s Nightclub from the end of 95 until 97/98. I was then the Operations Manager at The Globe Entertainment Complex which is now called Capitol. These were both dance clubs so I was already passionate about dance music and enjoyed managing Geisha Bar, even though the club was a lot smaller than the previous venues. What was the club before Geisha? And what were the other big clubs on the scene at the time? It was Krush before it was Geisha Bar. The previous owner Keith saw the potential in the room and had cleverly adjusted a Cabaret License to turn it into an dance club. Perth has a great history of great dance venues prior to Geisha. Early clubs Limbos, Berlin and James St pioneered the sounds. Later we had Aqua, The Jackal and the biggest club of that era DC’s, which ran for nine years, and included the second/back room that had been EON, Infirmary and later Gravity. What was the idea in the beginning for the club and do you feel it’s stayed fairly true to that ethos? In the beginning the club was very targeted toward woman, fashion and house music. The club has change hands a few times over the years but has definitely stayed true to that original ethos. Dance music was still relatively underground in Perth in the late 90s, but just starting to explode. The first dance music festivals were popping up. It was an exciting, booming time for electronic music and club culture at the end of the millennium. What do you remember about those days? The early rave and dance venues pioneered the scene hand in hand. Source Productions (Rob and Lisa McGregor) and another notable promoter at the end of 90s was Jeremy Junk with his company Delirium, responsible for some huge festivals. The impact these two promoters had, set up Perth to have a strong underground dance scene for many years. Other clubs that continued to push the boundaries for dance music in Perth were Ambar, Shape and Villa. Since then Perth has, and continues to have, several outstanding festivals, particularly from Boomtick, and Horizons. Of course, I also must mention Habitat and its commitment to putting on great events in and around Perth for 15 years, but hey, I am a bit biased there. 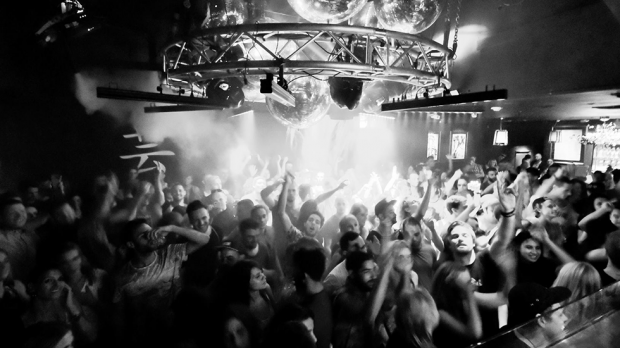 Twenty years is a long time in club years – how have you seen the Perth scene change and evolve? I think the dance music scene and the Perth scene in general has just grown up a lot. Unfortunately with that there has also been a lot of rules and regulations put in place that have probably taken a little bit of the ‘fun’ out of it for some people. Geisha has had to adapt to a lot of changes, including pubs opening much later, and recently many small bars opening, but we have always just stayed focused on being a really good house club. The only real change for us has been to keep evolving and developing musically. People always say it’s not like it used to be – there’s definitely some amazing things about the early days – but dance music is about the now. These days the scene is bigger and we get more international acts coming than back then. You seem to be going as strong as ever. What’s great about the Perth scene at the moment? People can reminisce, and yes, each was special for its own reasons. The most exciting times are always now. We would prefer to just look forward. There are so many amazing acts coming to Perth these days, every weekend. Punters are spoiled for choice. You guys have always placed a strong emphasis on local and resident DJs, and developing Perth talent, even hosting DJ comps that has uncovered some people that have gone on to big things. Why do you feel this is important? That was something we decided a long time ago, that the core focus and philosophy of both Geisha and Habitat was going to be about the music. To do that you need a team of really good DJ’s so that you have consistency ever week and every event. So we spend a lot of time developing our team and working with them. They are the biggest reason for our success. They are family. It’s pretty huge that you’ve got Way Out West coming to play a live set to help you celebrate! Nick and Jody have played for Habitat and Geisha many times over the years, and we were looking for acts that were a part of the history of Geisha. We have always wanted to have the boys come over with the full live show and when the opportunity arose we pushed really hard to try and make it happen. It would be very rare for Way Out West to perform live in such an intimate setting, but both Jody and Nick have always loved playing Geisha, so they agreed. It’s gonna be an incredible night! Quite a few internationals seem to love coming back to play Geisha. Who are some of your favourite DJs you’ve hosted? So hard to narrow that down – how can you choose between acts like Ame, Derrick Carter, Jeff Mills, Skream, MK, Patrick Topping? Or Australian acts that are killing it, like Dom Dolla, Set Mo or an impromptu set from Hayden James and Flight Facilities. Seeing Ben UFO seamlessly mix from Disco into Techno, Kink pulling off an incredible live set, only to see him listed as the Number 1 live act in the world on Resident Advisor the next day. Or even just seeing the look on the faces of locals, both new and experienced, when they pull off an amazing set. It’s hard to pick a highlight when our local nights can be just as fun and crazy as some of our international shows. What’s the Geisha family’s secret to success and longevity? Both great music and great staff. Geisha has always, and will always be, about the music, but equally as important is a great team of people to help you enjoy your night. We all share a passion for house music and have a great time doing it.